These were the words uttered by the very founder Shri Nanabhai Bhatt on the occasion of the inauguration ceremony of Lokseva Mahavidyalaya, established as the first humble educational endeavour of our country in form of ‘Gramvidyapith’. It was an enterprise to implement Nai Taleem Education System in Rural Higher Education. 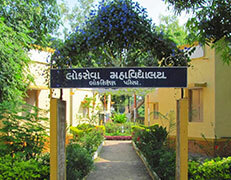 Lokbharti rural higher education institution is unique, pioneer and autonomous in the country since 1953. It is an empirical model ofGandhiji’s vision of basic education – NaiTalim. It promotes a unique, self-reliant lifestyle that strives to improve every aspect of people’s lives in rural India. The main aim of BRS course is to develop a cadre, who has willingness, abilities-skills and appropriate values to work with and for the rural communities to enable them for practising sustainable lifestyle and democratic values to bring prosperity and wellbeing. This outstanding and innovative model of education is a golden gift by legendry (Rushiverya) educationists Shri Nanabhai Bhatt, Shri ManubhaiPancholi, Shri Mulshankar Bhatt and Shri Natavarlal Buch for reconstructing new India to bring true Swaraj after political freedom from British rule. It has always been an institution delivering education to address the problems of rural India. It is a movement, a vision in action and rural revolution that imparts higher education to people otherwise unable to access it. While preparing the merit-list for the first year admission on the basis of the marks obtained by the students in HSC examination. The syllabus of Lokbharati has been always designed keeping a fair balance between Humanities as well as materialistic subjects such as agriculture, Animal Husbandry, Agronomy etc. Having autonomy in re-designing the syllabus, we can update our curriculum as to meet the needs and changes of time and society. While preparing new syllabus or re-designing, experienced experts, educationists, subject specialists, technical expertise and successful alumni students of the institute participate in order to have their valuable suggestions and guidance. A steering committee for the re-designing of present syllabus was formed by the Board of studies last year. At present, such steering committee has been doing required survey and planning to which the study council of Lokbharati also provides guidance. 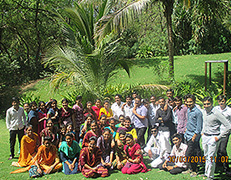 As Lokbharati is a residential Institute, All the students and faculty members along with their families. The philosophy and vision of the institute is to build character by staying together in the campus, so the celebration of festivals, public speeches and programmes are organized with this aim. Here, autonomy has been proved a real boon to us because we can fairly engage the students in such type of system which helps in developing national citizens. It has been also successful in creating a real human being through the education imparted outside the four walls of a class room. Extension, Education and Research are the three major aspects of Lok Bharati. The institute organises all the activities in such a way that all these aspects are always interlinked. The institute has taken care of this aspect. Hence, the Wheat Research Work is always accompanied with the students of F.Y.B.R.S (now semester I & II). And S.Y. B.R.S. They help in sowing the seeds, collecting the data, doing the observation and noting down it etc. The students of Animal Husbandry subject join the Animal disease Diagnosis and Treatment camp organised by Goshala (Animal Husbandry and Dairy Department). Students of B.R.S. studying in different years carry out planning, implementation and field work in relation to either farmers' Meet or Women Meetings in surrounding villages, which are adopted under the Ford Foundation Extension Programme. 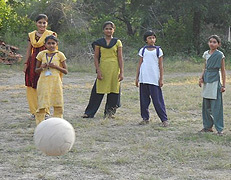 They also arrange their subject related programmes and activities frequently when they visit these villages. Last year, we could arrange the village camp - 'Gramshibir' and Work placement Programme of T.Y.B.R.S. in connection with Total Sanitation Campaign and PURA. The PURA project was a visionary dream of the then Hon' president of our country. The students got an excellent training during such special programmes. Autonomy helps in making co-related education very intense and effective through such type of Extension and Research activities. In order to sharpen the skills and inspire-the teachers for further study, 'Teachers' stUdy' group' (Karyakar Adhyapan Mandal) is already in existence. All the teachers of Lokbharati have a scope to present their study experiences, views and thoughts on the particular topic. The institute also arranges special training programmes for Teachers' efficiency Development every' year. The teacher welfare fund also helps partly by offering the financial assistance in subscribing periodicals The teachers are also given enough facilities and encouraged to attend important programmes out side the campus. Special arrangements in library have been also done for reading for the teachers They are provided 25 books during the whole year. Special requirements are also considered in this respect.. The internet facility of the college is regularly used by the teachers. The teachers are also given full freedom to purchase new books which are necessary to refer in their respective area of teaching. 1. Deprived Area Study Camp: Every year for second semester Gramvidya students, a "Deprived Area study camp" is being arranged for maximum 10 days or so. By organising this camp, it is expected that students may learn about tribal-life, social condition and nature of folk culture and also about their problems and study plans to solve them. The main activities in this camp are to arrange speeches of distinguished personalities about tribal community and to understand various aspects of tribal life-style and to survey it; Moreover, students are being taught with the tribal children songs, stories, games & to make them aware of the latest technology of agriculture and animal husbandry, village cleaning, school management and to build up relations by cultural programmes and collect tribal songs stories, languages and to prepare essay in form of documentation regarding it. The lecturers harmonise (correlate) this camp in accordance with their subject and also include as an important part and partial of the evaluation for final result of the semester. For the first semester students a "Balvadi Camp" is being conducted for one week with special purpose that the Balvadi Camp incorporates some skills among students which can be helpful to them in future the students will be able to take part in different activities and in their work experience. In this camp lectures, are being arranged related to children's stories, nursery rhymes, playing games and other children's activities in this camp. Moreover, to train the students about all these factors, many activities are also being arranged which become useful to different schools. It is noteworthy that along with students, parents also take part in cultural programs. As a part & partial of syllabus for fourth semester every year a• peasant family workshop is also being arranged for 10 days. Two students are being sent to the home of a peasant family to stay with them in this workshop. During the shibir the students stay there, eat over there only, and develop a rapport with the family. Students study the peasant family thoroughly (gather complete details) In addition to this, the students are being joined directly with this peasant family for 10 hours every day. Along with this, the students al&rstudy-about-village (public) relation, youth relation (mtrng=aiid=problems of village If possible an -convenient to them they work for adult education'& hildren development too. As a part and partial of syllabus; sixth semester students attend Gram shibir by staying in a village for 10 days Lectures on various subject, gram surveys, observations, study note, village cleaning as a part of social service, cultural programs, public relation, management of primary school, women activities, youth activities, games, smokeless stove, absorption pits, wall slogans, diagnosis camp related to various diseases are also being arranged during this shibir. This camp gives an opportunity to students to correlate the theoretical experience with society. 5. Educational tour of Southern India. For the third semester students, we organize an educational tour for 21 days every year. They visit various centres for considering educational aspect in the tour. Besides this art, culture, and the places for pilgrimage are also being included. This tour can be held in Gujarat state or out of Gujarat also. Students have to write a detailed note about this educational tour. Being a part of education, tour is also made a part of examination. The students of affiliated colleges of Bhavnagar University are also taking keen interest in this adventurous activity of student development. The students of BRS and MRS total 180 to 200 (amongst 50 to 60 girls) take part every year in it. The students of other educational faculties of Lokbharati Gramvidyapith also join in the programme Moreover, the teachers of other departments of this institute also join in this programme. In collaboration with Gujarat state mountaineering Institute of Junagadh and Mt. Abu as well as Bhavnagar University, students take part/participate an adventure & Basic course of tracking every year. After getting selection in it, students of Lokseva Mahavidyalaya have opportunity to develop physical ability and spirit of adventure. Yoga shibir is being held for students of Lokseva Mahavidhyalaya in association with Physical Education Dept. of Bhavnagar University for 3 days every year. The students are given the information about 24 "Asans" of "Yoga" and are trained directly about the knowledge of "Yoga". As a part and partial of Education, every Wednesday in a week an assembly is being held for the students of all the years in Lokseva Mahavidhyalaya including MRS. In this assembly students present the report and Expert's speeches on different subjects in the camps, experience based report of tours, Shibirs and comments of lecturers on particular incidents etc. are being included in it. The most remarkable thing is that students themselves organise this assembly, which, provide them a platform to express their views and thoughts regarding various on campus and out campus special educational programmes. emgãfratgdThiy Friday in Lokbharati Introduètion is also being given about the various department ofTLokbharti Institute. All the three year students have to take benefit of it. In the syllabus of Lokseva Mahavidyalaya "Hostel" is also in the centre. After taking presence of students at evening, various Experts' speeches and questionnaire are being organized regularly for the purpose of building different aspects among the students like learn together, live together and to work together. Because Hostel life and character building are in the central part, celebration of national festival and carnival are being given importance over here. Speeches related to incidence, outdoor games and sports programme, cultural programmes and unanimous feasts are being arranged on the occasion of the celebration of national festivals and carnival. Once in a term (semester) program of Anand Bazar is being held in which students themselves prepare the various food items in different stalls and sell it. Students committee supervises the event. Many skills are developed from the same. Anand Bazar becomes the festival of enjoyment. Since last some years--.we organise gandhijivan yatra on occasion of Gadhi jayanti, in which all the students and faculties visit in surrounding Villages in different teams and have a programmes like exhibition, Farmer's Meeting, Women Empowerment, Organic Farming, cultural Programmes, Farm Visit etc. Macaulay's Educational System emphasizes on the bookish knowledge which results in only one sided development of the learner, 'Nal Talim' on the other hand stresses upon the all round development of the learner. Education of Lokbharati keeps this idea of integral development in mind. This productive labour is planned keeping in mind its objectives, requirement of the institution and the students skills. 1. Requirement of the institution and the academy and student's skill for certain specific tasks. 2. Constant one or more than one day labour as per the requirements of agricultural crops. 3. Labour camps (SY) (120 hours of the year) during the season of harvesting. 4. Daily two hour labour to meet daily requirement. fees are paid from it, so they don't have to pay their educational fees in cash. Each student is assigned productive labour of 650 hours during three years of study.. The remuneration of the labour, as the educational fees, has been sanctioned by Gujarat government. This type of productive labour is arranged during the whole year which enables the students to be familiar with the activities undertaken by 'Go-shala' 'Nursery', farming, Wheat research, Laboratory, Vigyan Bhavan etc. It also achieves correlation of the activities conducted during the labour with the various subjects of their curriculum. By this programme e.g. students get the information about the section of cleanliness, Science of health, making Silage in 'Go-shala', crops of grass fodder, pasture, various kinds of crop, methods of farming, stages of crop-development, weeding, bacteria contaminating crops, scarcity of water for crop, manure etc. In gardening, they get acquaintances with floral plants of nursery, filling flower pots, grafting, office, flowers, acquaintance, and maintenance of flowering plants, meeting vegetable plants, cleanliness, taking notes regarding climate changes, moisture, temperature, direction of wind & its speed etc. "Shram Shibir" (A camp of 10 days) is an important program undertaken in S.Y.B .R.S. in which students are send to different farm family divided a team of 2 students. In this program students are involved with farm family in different agricultural operations and their day to day work and gain the practical experience. "Silage Shram" for 6 days is always organized in cattle briding farm for better understanding of the "silage procedure". The process of evaluation and assessment also gets benefits of the autonomy. All inclusive, constant and transparent, evaluation is made possible. The experts and heads of the institutes of outsides also evaluate our students, while they stay for work placement and special subject's educational placement programmes. also to be included as a part of overall evaluation of the student which sows seeds of moral-social responsibilities among them. may be other than written method. The teachers here find enough chances for experiments and innovative methods. Some of the examples are as under. Mahavidyalaya has considered Hostel life as a part and partial of education, where students are staying in the same hostel and doing all the works together. Involvement of the student in hostel activities (Community life) is an important aspect of the student's educational progress. Thus, even if a student should have got first class in his examination, but if his community life is found unsatisfactory, he is not allowed to promote to the further class. There is the reason for giving so much importance to Hostel life, the reason is that mere living together is not enough, but it should lead to natural selfless love, mutual understanding, and co­operation and further it should also develop sense of responsibility for a democratic way of life. The students, staying in Lokbharati Hostel, are involved in all kinds of work like preparing food, cleaning, filling up water and other routine work. Of course these duties are done by themselves in rotation, but no one is exempted from it. No peon or other servants are hired for these types of works. The daily schedule of the serving food, cleaning latrines and rooms and sweeping the Hostel and their premises etc. develops their efficiency in work and spirit of self reliance is developed among them Aspects of the Hostel life of Lokbharati are as under. 2. Removal of caste & gender inequality. 3. Development of affection & friendship. 4. Nourishment of good habits. 7. Selfless affectionate teachers-students relationship. A special committee has been formed to manage problems of the student staying in Hostel. There are 15 members in above committee which includes rectors of the different hostels, Principals, Directors. The chief rector is the chairman and final decision is left to the Director. Opinion of everyone is taken into consideration. The discussion in the meeting of above committee has been remained always open and academic. According to Gandhian philosophy, true education should develop the abilities of head, hand and heart among students. Lokbharati has proved that, this can be acquired through community life. Hence community life on the campus is harmonious & excellent. Lokbharati-Lokseva Mahavidyalaya is the institute working on the principles and values of 'Nal Talim-gt-fted-iy mahatma Gandhiji There are two degree courses offered namely B R S and MRS in the institution. It's a co-educational way of learning on the campus. Therefore, it pays vital attention to the overall development of a student and tries to shape him/her into a good citizen of our nation. In order to fulfil this aim, the institute also takes care for their financial and social stability. To satisfy the thirst of job-placement of students, students' counselling cell has been already started in the institute, It guides students in the areas of personality development, career counselling, expert-guest lectures, campus-interviews and the likewise activities Well known and reputed NGOs are invited for the campus interviews every year They select our students on the basis of performance and practical knowledge. They provide good incentives and pay-scales to the students. - To create and shape the personality and rural-oriented outlook among the students. - To provide better job opportunities by arranging campus interviews. 1. To organize seminars/workshops/guest-experts' lecturer for the guidance and training of the students of BRS and MRS information's of professional training courses are also provided by the teachers, officials and experts of the college as well as from the out-campus. 2. To make students aware of the better opportunities in the field of rural upliftment and also to make arrangement for placement programmes accordingly. 6. Students who are in need of financial assistance, are sent to the NGOs during vacation continuing their study to 'earn while you learn' concept. 7.We arrange placement programme or work-experience programme of the T.Y.B.R.S. and MRS students in different NGOs as a partial requirement to the BRS and MRS degree. They acquire practical knowledge of their respective special subjects during their stay. Money and time of the students are saved as the campus interviews are held on the campus. Application for /resumes/biodata are prepared in the institutesWhich—reethe economical burden on the students as compared to other govt. or semi-governmet recruitment procedures. No extra fees, charges or bonds are there for students while passing through the procedure here. Familiarity of the campus and proper guidance at the campus interviews remove the stage-fright and instill the self-confidence among the students. The real strength talents and skills come out through the campus interviews and demonstrative practical tasks. Higher scale of salary and other incentives are also offered to those students who have experience and better performance in any NGOs once joined. Students become aware of the real problems of rural area and they also learn how to put their knowledge in practice by studying various latest methods of PRA, surveys and public participation with the help of well-known NGOs such as CEE, Excel, Claris India, VRTI etc. Lokseva Mahavidyalaya has been carrying out research work in the field of Agriculture, Cattle breeding; Horticultural crops wheat as well as non conventional energy sources. Experiments on varietal testing, experiments on organic farming, composting, Irrigation methods, Feed management in Cattle, Non conventional energy sources have been organised regularly. made somewhere else but they were positively put into practice as well as demonstrated by Lokseva Mahavidyalaya on matters like use lady finger to white jaggary, horticulture, hybriding fruit plants and other plants, compost fertilizer. A wonderful and intense role was played by the institute persuading the farmers to accept and that way prepared them for new method, systems and researches. As the institute took a positive side to researches from the beginning, this activity has grown very well. Being a pioneer in rural higher education and contributing in desirable social change through education, Lokbharti has always tried to keep pace in line with changing needs of society. Lokbharti has consistently created a committed grass root cadre of rural youth who has successfully worked in many educational and developmental organisations. After having forty year of learning’s in under graduate course (Bachelor of Rural Study – BRS), as a vertical expansion of BRS, in 1992 Lokbharti started Master of Rural study centre. Initially course was designed to address human recourses needs of similar Gramvidyapiths – rural higher education institutes. However due, to various unavoidable reasons, these MRS pass-outs mainly started securing job opportunities in Non-Profit organisations. Different Pedagogy in MRS: The curriculum was designed, It was deliberate, well throughout decision that curriculum will not be teacher centric but students will learn- delearned – relearned through. Exposures to various rural realities. It was visualised that entire educational process should be demand driven. The role of teacher as facilitator and creator of conducive learning environment. It was also decided various departments of the institute will provide such opportunities to students. Master of rural study is recognized to the Maharaja Krishnakumarsinghji Bhavnagar University This post graduate centre for rural studies follows all the features and code of conduct of Lokseva Mahavidyalaya. At MRS nearly 30 graduates in any recognized university in any discipline are admitted every year. Since 1992 institute had revised the course at regular intervals. But looking at external realities, needs, challenges and emergence of new opportunities, radical change in curriculum and pedagogy is required today. Lokbharti has stated this process in consultations with university, selected corporate, professionally competent academic institutes and government. A teacher plays a significant role in the balanced development of a village. As it was considered an essential task to prepare trained dynamic teachers, Adhyapan Mandir had been already started in 1948 at the mother institute – Gramdakshinanamoorti, Ambala, well-before the establishment of Lokbharti. The Adhyapan Mandir was recognized and due autonomy was also sanctioned by the state government in matters of admission, examination-evaluation, result and certification, carrying out experiments in teaching-learning processes. With a purpose of enhancing the ability and scope, this Adhyapan Mandir was shifted to the campus of Lokbharti in 1954. The admission procedure has been centralized by the state government since 2002. The competency based syllabus of this two year training course offered after the higher secondary level, was designed in 1998 and approved by National Council for Teacher Education (NCTE) in 2000. Sarvodaya, faith in Gandhian thoughts, socially useful productive labour, experience based training imparted through the mother tongue with co-relation and the likewise elements are considered as the means of bringing about social change in basic education. In this context the educational programmes are planned here as to fulfil the objective of preparing primary schools and post-basic schools of Nai Taleem. Community life, domestic duties-self-dependence, physical labour, khadi, simplicity, co-education etc. constitute the code of conduct in the same way as they are found in other educational sections of Lokbharti. Understanding and insistence for the use of Swadeshi and Gramodyoga things are clearly expected. After the training, students have been found working devotionally, understanding the attitudes and needs of their students and the physical requirements of the school. They have been role-models of leadership at local level democracy and also performing special responsibilities efficiently if any assigned to them. They have been also honoured and credited in their respective field across the educational world of Gujarat. Efforts are made to impart the training for the understanding of original nature and interrelationship of the education, teacher, students and parents, so that they can justify their teaching profession in future. Character-building process is concretized through community life, domestic-duties, self-dependence, co-education, physical labour, khadi, simplicity, collective prayer, festival, cultural programme, songs-music, sports, students‟ council, Lokbharti-orientation camp, service-oriented duties, Sarvodaypatra, etc. Co-curricular programmes such as lectures, group discussions, self-study, subject-related field work/rural area visits, seminars/workshops, guest lectures, village internship, gramjivan sampark yatra, kindergarten camp, work-experience placement, educational tours/visits, film-shows, self-cooking-nature study camp, sky-gazing, etc. shape our teaching and learning process variegated, interesting, live and fruitful. Socially useful productive physical labour, gardening, kitchen-garden, spinning yarn-camp, etc. beget the sense of respect and sensitivity towards the laborers. Skill strength development and the pride of labour are cultivated among the students by allotting them labour-work every year engaging them into various socially useful productive works. The training s/he receives here regarding cleanliness and beautification will be helpful to him/her making the school campus attractive and beautiful in future. The trained teacher of this section can make the teaching-learning process interesting, easy and life-oriented with the appropriate application of TLMs (Teaching Learning Materials), songs with acting, storytelling, role-plays and various activities. Apart from the craft of spinning and agriculture, training of computer is compulsory. The education devoid of fear, prize-lure and competitions assists to achieve the balanced-development, attaining the mutual love, respect and co-operative service-attitude. Along with the skills, the due emphasis on the language-behavior and community life makes the student polite and responsible. All curricular activities train students about the methods of teaching and learning, developing scientific vision and research attitude. Active participation is sought during the science-extension activities of the primary schools, held by Lok-Vigyan Kendra (Community Science Centre) inside and out-side the campus. Off-campus and in-campus activities devoted to the integrated education of Hand, Head and Heart, provide opportunities for the self-confidence and personality development. Use of modern educational technology (ICT enabled learning) creates here enough scope to match up with the contemporary trends of Nation. Due emphasis is given to the study of English language and computer-internet-application as a part of their syllabus. Effort is made to spread awareness regarding the importance of education and school for democracy, socialism and secular Nation-building without having any discrimination. The teachers imparting training here are informed with the National and International trends of Education. Constant efforts are made to enliven the contacts with the parents and former students for suggestions and feedback. The faculty-members are also provided opportunities and occasions to develop their efficiency-ability by allowing them to take part in useful off campus programmes. Freedom is given to the teachers to adopt various teaching methods, experiments in teaching and evaluation systems during examinations. The untrained graduates, working as the teachers in post-basic secondary schools-lokshalas for many years, required to have training at the then available centre- Graduate Basic Training Centre (GBTC)- of Mangrol, Rajpipala and Ahmedabad. These centre were started by the visionary Chief Minister of the bilingual Mumbai State Shri Balasaheb Kher in Maharashtra and Gujarat, for imparting the training to the teaching and administrative staff of Nai Taleem Adhyapan Mandir. The State Government of Gujarat administrated those centre and the Gujarat State examination Board had authority to conduct the examination and issuing certificates. The founders of Lokbharti considered the importance of training of three responsible persons: farmers, Gram-sevak-the village secretary and teachers, for the rural-welfare constructive programmes. To meet this requirement, Snatak Nai Taleem Kendra (GBTC), a complete residential centre, was started at Shetruji Dam site campus of Lokbharti in 1969. This training centre was shifted to Lokbharti, Sanosara in 1972. 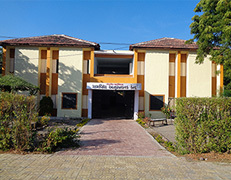 The centre was recognized by the National Council for Teacher Education (NCTE) in 2000 and also got affiliation with the Maharaja Krishnakumarsinhji Bhavnagar University in 2006 as ordered by the Education Department of Gujarat Government. The centre was named as Snatak Nai Taleem Mahavidyalaya. After the affiliation with the university, the trainees have been conferred the degree of B.Ed. (Basic). The admission process follows the rules and regulations laid by the University and NCTE. This one-year course after graduation offers teaching methods of Agriculture, Hindi, Gujarati, Science, Mathematics, English and some optional subjects. The course has been following the semester system since 2006-07 as directed by the U.G.C. Sarvodaya, faith in Gandhian thoughts, socially useful productive labour, experience based training imparted through the mother tongue with co-relation and the likewise elements are considered as the means of bringing about social change in basic education. In this context the educational programmes are planned here as to fulfil the objective of preparing teachers-education officers and administrative officers of post basic primary education. Community life, domestic duties-self-dependence, physical labour, khadi, simplicity, co-education, etc. constitute the code of conduct in the same way as they are found in other educational sections of Lokbharti. Understanding and insistence for the use of Swadeshi and Gramodyoga things are clearly expected. After the training, students have been found working devotionally, understanding the attitudes and needs of their students and the physical requirements of the school. They have been role-models of leadership in local level democracy and also performing special responsibilities efficiently if any assigned to them. Character-building process is concretized through community life, domestic-duties, self-dependence, co-education, physical labour, khadi, simplicity, collective prayer, festival, cultural programme, songs-music, sports, students‟ council, Lokbharti-orientation camp, service-oriented duties, ‘sarvodaypatra’ etc. Co-curricular programmes such as lectures, group discussions, self-study, subject-related field work/rural area visits, UGC sponsored seminars/workshops, guest lectures, village-placement, gramjivan sampark yatra, kindergarten camp, work-experience placement, educational tours/visits, film-shows, self-cooking-nature study camp, sky-gazing, etc. shape our the teaching and learning process variegated, interesting, live and fruitful. Socially useful productive physical labour, gardening, kitchen-garden, spinning yarn-camp, etc. beget the sense of respect and sensitivity towards the labourers. Skill strength development and the pride of labour are cultivated among the students by allotting them labour-work every year engaging them into various socially useful productive works. The training s/he receives here regarding cleanliness and beautification will be helpful to him/her making the school-campus attractive and beautiful in future. The trained teacher of this section can make the teaching-learning process interesting, easy and life-oriented with the appropriate application of TLMs (Teaching Learning Materials), acting songs, story-telling, role-plays and various activities. •	Apart from the craft of spinning and agriculture, training of computer is compulsory. The education devoid of fear, prize-lure and competitions assists to achieve the balanced-development, attaining the mutual love, respect and co-operative service attitude. All curricular activities train students about the methods of teaching and learning, developing scientific vision and research attitude. Use of modern educational technology (ICT enabled learning) creates enough scope to match up with the contemporary trends of Nation. Due emphasis is given to the study of English language and computer-internet-application as a part of their syllabus. The faculty-members are also provided opportunities and occasions to develop their efficiency-ability by allowing them to take part in useful off campus programmes. Freedom is given to the teachers to adopt various teaching methods and experiments in teaching.